Amira's Roomz i Zanzibar, Tanzania: Bestill nå! 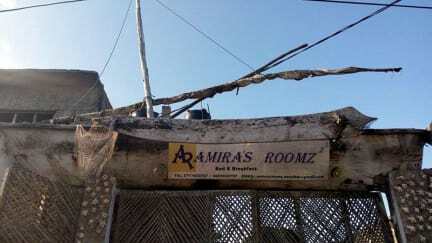 Amira's Roomz is a family run guesthouse near Zanzibar International Airport. We specialise in short-term transit stays. Perfect for preparing for a long journey or arriving from one. We provide free airport pick-up/drop-off at anytime. Many local shops and cafes walking distance as well as a sunset beach a short leisure walk from the guesthouse. We are located just 2 minutes from airport in a safe and quiet local neighbourhood away from all the tourist traps. Beautiful beach is just a short walk from the guesthouse. You will be able to witness beautiful sunsets daily and share this with the local neighbourhood children. 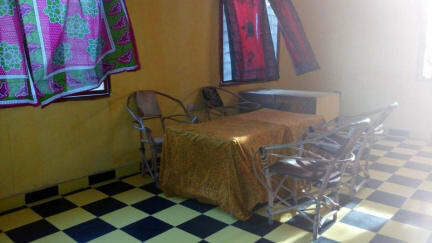 Stone Town is just 5 minutes away by Daladala which is available all day. Great location for those looking to experience the true local way of life while still being close to everything. Basic and clean ensuite rooms with all you will need in a quiet area. We provide free one breakfast in a double room and others at minimal cost in the morning. Wi-Fi is free. Common indoor/outdoor relaxing areas with transitional vibes. Breakfast included for rooms (one person in double) only. Breakfast is charged extra for Hostel Roomz beds. Pickup or drop-off included only for rooms (indicated in welcoming message). Pickup or drop-off is charged extra for Hostel beds and has to be requested in advance.